Freshwater clam can be found in lakes and rivers. The seasons to gather freshwater clams is said to be during the winter and summer months. It is generally found eaten in miso soup in addition to other foods such as pasta. 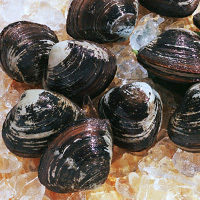 The calories in Freshwater Clam per 13g(1cup edible part) is 7 calories. Freshwater Clam is calculated to be 51Cal per 100 grams making 80Cal equivalent to 156.86g with 0.73g of mostly protein、0.56g of carbohydrates、0.13g of fat in 13g while being rich in vitamins and minerals such as Vitamin B12 and Copper.